The white cloth of this basket hides an immense treasure: unlimited sticks of bread. While they are simple in flavor, the breadsticks are hot and fresh when removed from the basket. 4+1d4 breadsticks may appear at a time. For more breadsticks, politely ask the basket and they should appear in the next few minutes. Being snippy or impatient with the basket may result in longer wait times or burnt breadsticks. Breadsticks not eaten within an hour of being removed from the basket will disappear. Attempting to raise the white cloth and stare directly into the planar abyss will cause 1d8 psychic damage as your mind is corroded with sounds of agony and torment. Breadsticks are guaranteed to be made from free range, organic nightmares. If your Basket of Endless Breadsticks breaks, please contact customer service located in the Realm of Gluten. 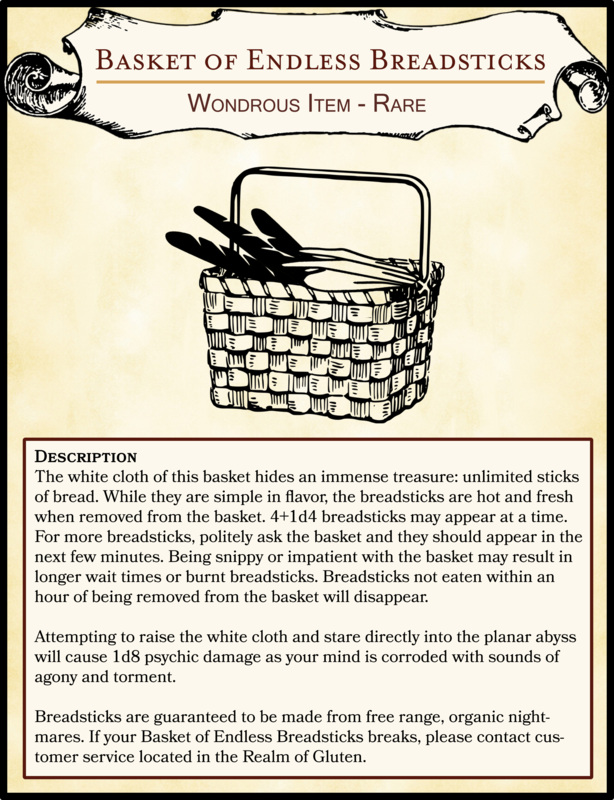 Warning: Do not give to chaotic bards, they will use this powerful magic item to make people walk into invisible walls and get your party kicked out of the inn…twice.